Mutant Football League is not to be confused with Mutant League Football. The latter is a Sega Genesis game from 1993, while the former is its spiritual successor—but they both share Michael Mendheim as their lead developer. 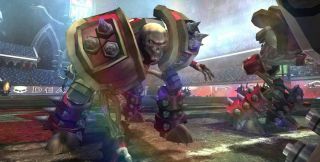 Mutant Football League is an arcade-football game where killing the enemy players is just as viable a strategy as getting the ball into the end zone. Watch the video above to see Mendheim give a firsthand look at the brutal "sports" game in action. Mendheim also talks about the possibility of opening up the PC version to the community after release, allowing players to create and share their own teams, logos, and unique plays.